American made dress socks are a staple of fashion among men around the country. These classic and stylish clothing items tie together an ensemble with sophistication. Crafted with relaxed cotton or combination of cotton and nylon fibers, dress socks may contain an elastic band to keep the wearer comfortable. Dress socks may be worn with any type of closed-toe footwear, from loafers to boots. Traditionally, dress socks are paired with dress shoes such as oxfords. Dress socks have been a constant in men's wardrobes for centuries. Because of the relaxed fit, men in the past have experienced droopiness and slipping of their dress socks. Wearers had resorted to pairing their dress socks with suspenders and garters to decrease slipping. However, the invention of spandex during the 1960's eliminated this problem with stretchier and more durable craftsmanship. Dress socks have seen reinvention with each passing year and with new trends in men's fashion. While lightweight styles can be worn with an everyday outfit, there are variations of dress socks that pair perfectly with formal attire. Dress socks are generally a staple fashion accessory for a tuxedo or suit. Men in wedding parties may purchase matching socks together to accentuate their formalwear. Dress socks can also be worn with informal attire, such as jeans and slacks. These versatile accessories keep a man's outfit comfortable and fashion=forward. Dress socks may come in a rainbow of colors and monochrome tones to match the wearer's ensemble. Traditional styles of dress socks include checkerboard patterns and a houndstooth print. American made dress socks are also available in a variety of lengths. 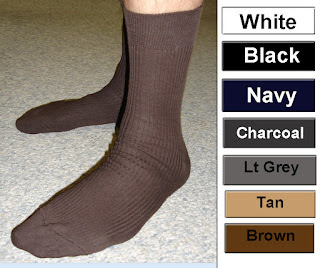 Mid-calf is the most popular length of men's socks, followed by ankle and over-the-calf styles. These socks can be hidden underneath pants or displayed with shorts. Dress socks can be found in ribbed styles for a snugger fit. Sometimes called "trouser socks," these items have remained a lasting fashion staple for men and boys around the country. Dress socks maintain their popularity as an elegant and stylish accessory that can be worn at any event.